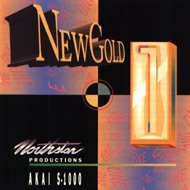 New Gold 1 is a CD-ROM for the Akai S1000 Series Samplers which incorporates 50 banks of digital instrumentation. With over 1,500 programs, it contains a wide variety of instrumentation to allow the composer/performer incredible options. Over 182 megabytes, tons of sounds; and now at $195, that's less than $4 per bank!